White Cloud Mountain minnows (Tanichthys albonubes) are a small, brightly coloured freshwater fish with a silver-green body and bright red fin and tail. They are very hardy and breed easily, making them a popular ‘starter’ fish for aquariums and fish ponds. There is one known population of White Cloud Mountain minnows in NSW. Detrimental interactions with introduced pests are considered a major threat to native aquatic biodiversity, and the 'Introduction of fish to freshwaters within a river catchment outside their natural range' is listed as a key threatening process under the NSW Fisheries Management Act 1994. 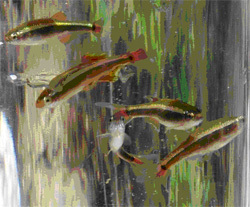 White Cloud Mountain minnows are a member of the Cyprinidae family, along with the European carp. They are native to China, having first been discovered at White Cloud Mountain in Guangdong province, but are reportedly now rare in the wild in China. They are a hardy freshwater fish, which tolerate a wide range of temperatures and variations in water quality. Their ability to tolerate cool temperate waters (as low as 5ºC) means they have the potential to survive in most NSW waterways. White Cloud Mountain minnows can grow to 4cm in length and generally feed on zooplankton and detritus. They are considered easy to breed in captivity and release their eggs amongst vegetation. In late 2002, a feral population of White Cloud Mountain minnows was found in Green Point Creek, a small intermittent freshwater stream that flows from a steep, forested headwater catchment, off a 10m high waterfall, and down to Pearl Beach near Gosford (north of Sydney). The creek consists of a series of small pools of varying depths (approx 20cm to 1m), which provide refuge habitat for fish when the creek is not flowing. White Cloud Mountain minnows are not only a fairly common aquarium fish, but are also widely sold for stocking backyard fish ponds (they have been heavily promoted by some groups as a ‘tadpole friendly’ species for mosquito control). The feral population in Green Point Creek is most likely the result of fish being washed out of backyard ponds during heavy rains. In late 2005, 2000 native Australian bass fingerlings were released into Green Point Creek as a form of biological control, in the hope they would prey on the introduced minnows. However, a follow up survey of the creek indicated that few of the fingerlings had survived, probably because the water quality (very low pH) was unsuitable for Australian bass. In 2007 and 2008 DPI proposed to attempt to eradicate White Cloud Mountain minnows from Green Point Creek; however these proposals did not receive support from either the local Council or funding bodies and were consequently abandoned. The population of White Cloud Mountain minnows is still present at this location, however, there is no immediate threat of this population spreading further. DPI continues to monitor fish populations in coastal and inland rivers. If any new populations of White Cloud Mountain minnows are discovered they will be assessed, and where possible, action taken to control or remove them. There is no information on the impacts of White Cloud Mountain minnows on native fauna. They are small and non-aggressive, suggesting impacts may be relatively minor compared to some other introduced species. On the other hand, White Cloud Mountain minnows breed rapidly and are hardy so they have the potential to reach large population sizes and compete with native fish for food and habitat. What can I do to help stop the spread of aquatic pests? Well-established pest fish species are difficult to control. However, there are some options for their management and improving the odds for native fish. Management of issues such as water quality, environmental flows, fish passage and snags can maintain or return conditions to those that best suit native fish. This improves the ability of native fish to compete and creates conditions less suitable for pest fish species. More information on habitat management and rehabilitation. The spread of pest fish species has often been associated with their use as bait. For this reason, use of live fish as bait in freshwater is illegal in NSW. Other things you can do! Design backyard fishponds carefully to prevent the unwanted release of fish during heavy rains – for example, by using fine screens on overflow areas. Wherever possible, stock ponds with native species endemic to your local area. Be on the look out for new species in your local waterways. If you find a fish that you think might not be native to the area, or that might be a White Cloud Mountain minnow, take a digital photo and/or freeze the fish whole as soon as possible and report it to DPI. In some areas, local community groups form to help in the fight against unwanted aquatic pests – Be involved!